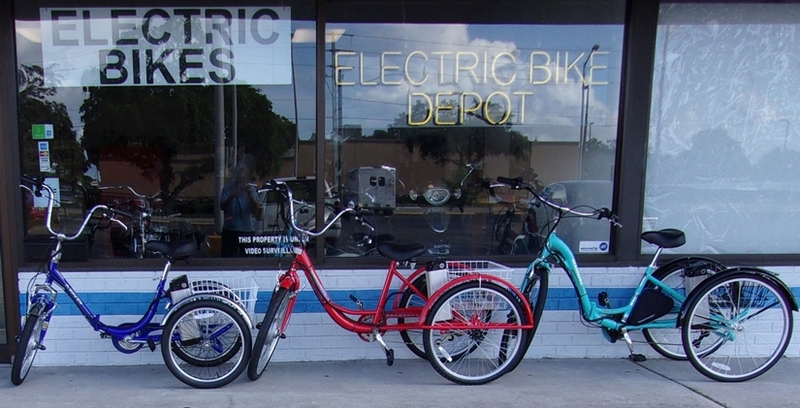 We convert Schwinn, Kent, and most other make trikes. Each trike is built to order as one size does not fit all! What is the cost? The answer depends on the voltage and wattage of the electric motor kit and the AH (amp hours) of the battery pack you choose. LCD & LED display are also a factor in the cost. An assembled trike by itself can go from $300-$400 depending on wheel size and whether single speed, 6 speed or 7 speed. As a theft deterrent all Lithium battery packs are locked into place. 500 watts is recommended as a minimum power, other power options are available. Trike colors vary by availability. We have many satisfied clients from Arcadia, Ellenton, Lakewood Ranch, Palmetto, Ruskin and The Meadows who drive the distance to get a quality product. FOR SAFETY IT MUST HAVE BOTH FRONT AND REAR HAND ACTIVATED BRAKES!